THE WOUND is John Trengove's sublime but harrowing meditation on the secret conflicts between traditional masculinity and modern love among the amaXhosa. This week South Africa must decide which of its films to submit for the Oscars’ Best Foreign Language Film category. Likely, it’ll come down to a choice between The Wound, which has the advantage of having collected a plethora of festival awards since its premiere at Sundance, and Five Fingers for Marseille, which has the advantage of having just premiered at TIFF to universal praise. I have, alas, not yet seen Fiver Fingers for Marseille, though by all accounts it’s impressive, and by some accounts an outright tour de force (you can read Screen Anarchy’s review here). The Wound, however, I have seen, and frankly I find it hard to imagine a more important South African film this year. 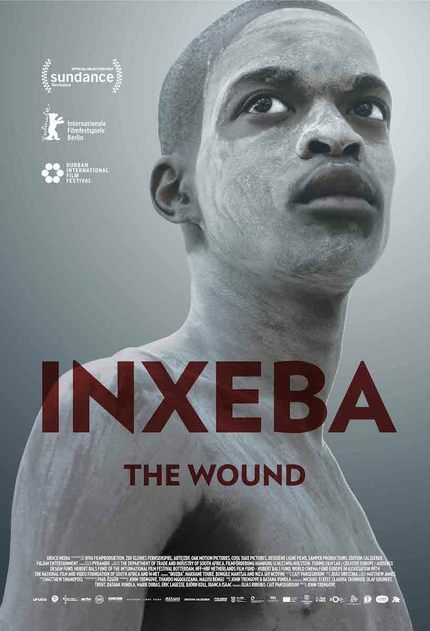 Ostensibly, the film’s title, and more explicitly its original Xhosa title - Inxeba - refers to the ritual circumcision that young men undergo during Ulwaluko (or ukwaluka), an ancient Xhosa rite of passage to manhood. There is much about Ulwaluko that is considered highly taboo to openly discuss, but it is generally known that participants - initiates - spend weeks in the wilderness healing and learning about manhood. Healing from unanesthetized circumcision, traditionally by spear tip, happens in isolation and deprivation with the use of traditional muti (medicine) only. Hardship is an essential element of the passage to manhood. Sadly, every year sees many cases of infection that lead to tragic deformities, dismemberments, and deaths. Still, each year tens of thousands of boys aged 16 to 19 undertake the sacred ritual, passing into manhood and social acceptance through a combination of personal endurance, brotherhood, and mentorship on the lore, language, and expectations of masculinity. The Wound is not, however, a critique of Ulwaluko, which if anything it depicts with reverance befitting such a sacred social rite. Rather, Ulwaluko is the setting, and like any cinematic environment it serves a story - the story of Xolani, in a stunning breakout performance by Nakhane Touré (nowadays just Nakhane), and the wound inflicted upon his heart by a world that does not permit his kind of happiness. Homosexuality is a socially ostracizing fact of life in much of Africa, and South Africa is little different despite our dubious claim to fame - that of being the first country in the world to explicitly enshrine constitutional protections against discrimination based on sexual orientation or gender identity. We were fortunate, beyond measure, to have enlightened minds like Nelson Mandela craft our Constitution in the relative modernity of the early 1990’s, but Constitution is not culture. Homophobia remains the norm in many traditional world views, and is widely considered quintessentially “un-African.” I find myself wondering to what extent this might have originated with, or been exacerbated by, the widespread integration of conservative Christian values into myriad tribal cultures during the continental conversions of the 19th and 20th century. But that’s perhaps a question for another movie. In this movie, Xolani returns to “the mountain” to serve as khaukatha (mentor) to Kwanda, his umkhwetha (initiate). Kwanda is an obviously gay city kid from Johannesburg, seemingly disconnected from and disinterested in Xhosa traditions, and undertaking Ulwaluko under parental pressure. His father hopes it will harden him up, and straighten him out in the sexual orientation sense. Ulwaluko is incredibly sensitive territory for a film to enter because of the profound secrecy surrounding many aspects of it, and homosexuality in the context of Ulwaluko is especially treacherous ground to cover. The whole point of Ulwaluko is, quite literally, to become a man, and there are powerfully entrenched patriarchal expectations that dictate what it means to be a man in Xhosa culture. Homosexuality has no place. Many young men participate with the hope, or more often the hope of their parents, that Ulwaluko will exorcise these “childish” urges. Pain, endurance, and deprivation are a part of the process for all initiates, but openly gay initiates can be subjected to especially harsh treatment. Many are forced to hide their sexuality, and can come away alienated and ostracized from the very society they are seeking to enter. Alternate (i.e. modernized) models of masculinity and manhood are all but unheard of. The current frenzy of unwelcome publicity notwithstanding, it was only a matter of time before the world discovered Nakhane. His performance in The Wound is utterly mesmerizing, and deeply moving; entirely deserving of the multiple Best Actor awards he’s won on the festival circuit. That this is his first acting role boggles the mind, but he is a proven creative wunderkind, and if ever there was a role he was born to play this may well have been it. Nakhane is umXhosa, with deep roots in Xhosa tradition and spirituality; his respect for Ulwaluko is sincere (though not naïve) and based on personal experience. Prior to The Wound he had already risen to some modicum of prominence as an openly gay African man, fighting his existential battles publicly through music (his debut album in 2014 - Brave Confusion - is a masterpiece that won Best Alternative Album at the South African Music Awards) and writing (he published his first novel - Piggy Boy’s Blues - to wide acclaim in 2016). Nakhane’s art just is his way of coming to terms with himself, and the receptivity of audiences to his work in various mediums has become an important factor in the trajectory of LGBTQ issues in South Africa. Without wanting to downplay the value of his music and writing, The Wound strikes me is something on another level entirely. This film would be worth watching for Nakhane’s performance alone, but it cannot be emphasized enough how good The Wound is as a whole. First time feature director, John Trengove, is either extraordinarily brave or blithely foolhardy to have taken this on, particularly as a decidedly white and non-Xhosa South African. All evidence points to bravery. The deftness and sensitivity with which he has executed not just the film, but the entire undertaking, speaks to a director of genuine integrity and considered audacity. The directing awards Trengove has collected for the film speak for themselves. Wisely, Trengove partnered with two Xhosa writers to craft the script, Thando Mgqolozana and Malusi Bengu. Mgqolozana previously wrote the novel A Man Who Is Not A Man, which was the seed of Trengove’s first foray into Ulwaluko, the short film iBhokhwe (The Goat), which premiered at Berlinale in 2014 and went on the screen at over 40 festivals. You can, and should, watch this outstanding short here. The small cast is rounded out by Niza Jay Ncoyini, who plays Xolani's initiate, Kwanda, and Bongile Mantsai, who plays Vija, a mentor overseeing three initiates of his own. Vija and Xolani were initiates together when they undertook Ulwaluko in their youth, and every year since they’ve returned to the mountain to serve as mentors. Their true motives for returning are revealed to be each other. Over the weeks in the wild their long friendship rekindles, lustful and loving, but a secret tragically thwarted and contorted by reality beyond. Mantsai as Vija is particularly good, and Nakhane owes much of his performance to Mantsai’s. Vija appears to have embraced traditional masculinity, both physically and socially, in a doomed effort to conform. It’s clear he has coping addictions and a life in shambles. Xolani seems to live just for these few weeks on the mountain each year, enduring his own sham of a life, but motivated to keep his life together by a desire to help support Vija. In one small but fascinating exchange, Xolani gives Vija a wad of cash - clearly not for the first time - to help his destitute friend. It’s impossible to tell whether Xolani is playing the “traditional provider” role, as a breadwinner husband to a wife, or the frequently encountered (in South Africa) subversion of this, as a breadwinner wife to an alcoholic or otherwise broken husband. Both work, and neither, which is of course the whole point: we cannot and should not impose heteronormative models of masculinity and femininity onto individuals and relationships that are not. The rich ambiguity of this little moment is just one example of countless such moments wherein The Wound reveals just how complicated it all gets at the intersection of tradition, modernity, patriarchy, and sexuality. João Orecchia, who scored The Goat for Trengove, returns to provide a brooding score, often - but effectively - in uneasy discordance with some gorgeous cinematography from Paul Özgür. Özgür’s camera seems to float through the movie, anchorless, much like Xolani and Vija float through their lives, and the dreamscape of their time on the mountain together. As the end of Ulwaluko draws nigh, Xolani’s desperation grows as Vija withdraws, preparing to return to his semblance of a normal family life in spite of their feelings. As Kwanda’s affection for his mentor grows, so too does his animosity toward Vija, a looming conflict all the more complicated by his own perceived maturation to manhood, and Vija’s seeming rejection of his own true nature (and thus also Kwanda's). At stake are secrets from the mountain that would upend lives if revealed, but whose repression has already left wounds likely never to heal. The Wound has been justifiably compared to Brokeback Mountain. The films share intense depictions of gay relations, both emotional and carnal, in a traditionally hyper-masculine context. They also share a deep well of directorial sensitivity, soul-rending performances, and a willingness to look complexity in the eye without trying to explain it away. As in Brokeback Mountain, the privacy of wilderness is also paramount; without this escape from the constraint of cultural chains, true feelings might never see the light of day. What most obviously differentiates The Wound from other gay cinema, and indeed other cinema full stop, is the sometimes shocking, always intriguing, and cinematically unprecedented setting within Ulwaluko. For this, it would be easy to criticize Trengove as a provocateur who has leveraged taboo for impact. In lesser hands, perhaps such criticism would hold water, but not here. Originality alone can count for a lot on the silver screen, but when originality sincerely serves the soul of a story the result is inevitibly something quite profound. The Wound stands as a masterpiece of modern South African filmmaking, and an essential contribution to the social struggle for life and love for all.